Av de Palencia, 3, 24001 Leon, Spanje. 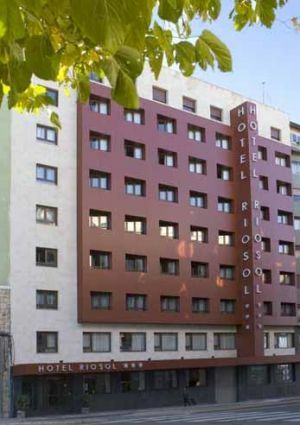 Elegant hotel nearby the Cathedral of Leon. 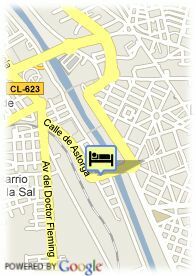 Temple Riosol Hotel is placed at 5 minutes from the old town of Leon strategically located next to the railway station. The establishment disposes of 126 rooms with the necessary facilities in order to offer to the client the possibility of enjoying relaxing moments after a full day. The rooms have parquet flooring and a warm decoration based on soft colours combined with reddish tones. Temple Riosol Hotel offers 3 totally equipped lounges with capacity for up to 200 people where to hold any kind of reunions or company reunions. The establishment completes its facilities with a multifunction lounge, Internet connection, reading lounge, snack-bar with a select buffet breakfast and a restaurant of an intimate and quiet atmosphere. Betalende overdekte parking aan het hotel (16.05 €), Busparking.